Every heritage luxury brand worth its weight has a flagship bag — Chanel has the Classic Flap, Hermès has the Birkin, and Christian Dior has the Lady Dior. With classic clean lines, feminine accents and a structured shape, Dior’s ladylike handle bag was destined for icon status all along, but it was handed a major leg-up from its equally iconic and most famous fan, Lady Diana Spencer of Wales. The bag debuted in 1994 under the name Chouchou, French for favorite. One year later, former First Lady of France Bernadette Chirac gifted one to then-Princess Diana, who immediately fell in love with the bag and was frequently snapped by the paparazzi while carrying it, prompting the brand to rename the bag, “Lady Dior” in her honor. 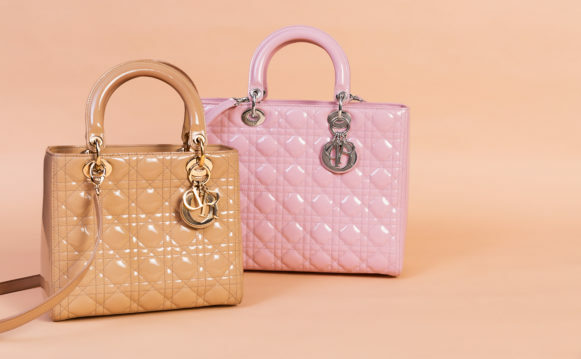 Unlike many of the brands’ other products, the Lady Dior bag is only sold in Dior boutiques, making it all the more difficult to come by, and therefore frequently counterfeited. Learn how to separate real from faux with Wetzbarger’s expert tips. The iconic cannage quilting seen on many Dior items was inspired by the canework used on the Napoleon III chairs at Christian Dior’s first runway show in 1947. “The quilting should be precise and centered at the front. However, if the pattern doesn’t match up perfectly with the bag’s edge, that would not be a sign of inauthenticity since the pattern’s scale doesn’t change based on the size of the bag,” explains Wetzbarger. “The zipper pull features the Dior cartouche, the oval logo commonly seen on Dior pieces. It is attached to the zipper with four chain-links (three big and one mini), which give it a jewelry-like quality.The zipper pull has to be strong for a sturdy, structured bag,” says Wetzbarger. Ready to invest? Shop our edit of authentic Lady Dior bags here. FEATURE IS COACH THE AMERICAN GUCCI?